Music was always part of Henri Matisse’s (1869-1954) life. He played the violin on a daily basis, reflecting the rigorous structure and precise technique which corresponded to his artistic methods. It also provided him with an escape and source of inspiration. Some of the early paintings of his room at the Hôtel Beau Rivage in Nice, where he would spend many months from 1917 onward, depict a violin or an empty violin case; in others, a figure is seen with its back to us, playing the violin in front of an open window. Music also played an important role in Matisse’s family life — one of the most important paintings in the Barnes Foundation in Philadelphia shows his daughter Marguerite at the piano with her brother Pierre (who also played the violin), in front of a score by Haydn. His other son Jean played the cello. For Matisse, the innumerable instruments, such as harmoniums, violins or gramophones, replicated the movements of his models which, by their decorative shape and aesthetic nature, were then reflected in the arabesques and curves of the paintings’ composition. For him, even the movements of musicians imitated the diverse, undulating forms of objects and models. Music was not only the basis for his work in that it structured his compositions, its themes, rhythms, variations, harmony, and colour, but, almost naturally, it would lead him to incorporate dance as well – to the movement of figures in real space. In 1909, the Russian collector Sergey Shchukin, commissioned Matisse’s paintings ‘La Musique’ and ‘La Danse’. The circle of dancers became the inspiration for the monumental fresco commissioned by Dr. Barnes for his mansion in Merion, Pennsylvania. 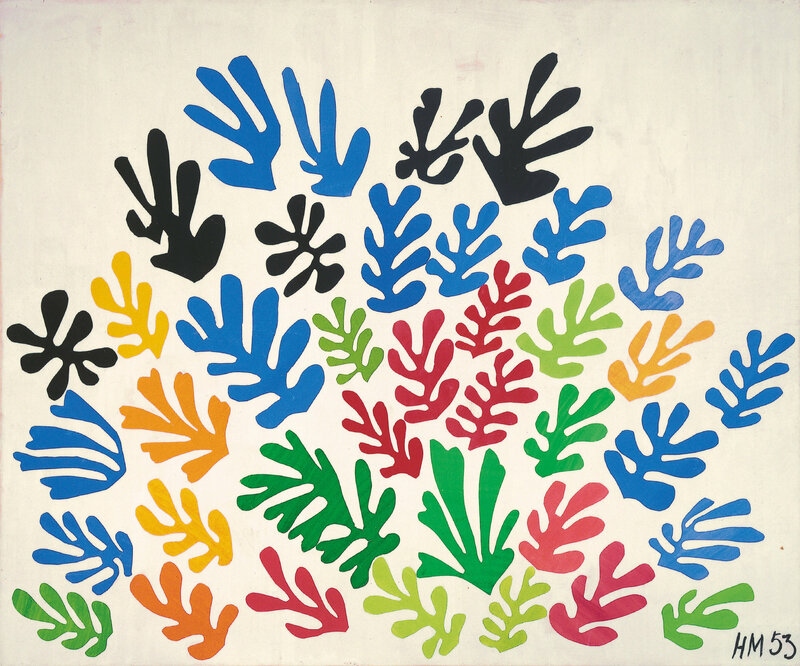 Matisse was inspired by the three rounded arches (lunettes) which reflected the dynamism of his dancing figures. While working on the fresco, Matisse made use of cut-out coloured paper to test the various effects of form and movement – a method he would later perfect after he could no longer paint. Throughout Matisse’s life, dance had played a significant role – not only as inspiration and as themes in his paintings, but also in working directly with dance companies. He had designed the sets and costumes for ‘Le Chant du Rossignol’ of Diaghilev’s Ballets Russes, with music by Stravinsky. In 1937 he was asked to produce the ballet screen for Léonide Massine’s ballet ‘Rouge et Noir ou Étrange Farandole’. The gouache cut-outs, with their inspiration coming from the circus, its performers, shapes of nature, and his travels to Morocco and Tahiti, are “cuts into colour” — their improvisation and vitality echoing those of Jazz. Although born in America, the art of Jazz continued to evolve in Paris between the two World Wars. American expatriate writers, musicians and performers, such as Josephine Baker and the Révue Nègre, contributed to its success. Many African-American musicians found the artistic recognition and freedom in Paris which had been denied to them in the United States. As Jazz evolved, many of France’s other avant-garde artists adopted it as the sound of the 20th century, using it as inspiration in their own artistic endeavours. During the last years of his life, Matisse designed the Chapelle du Rosaire for the Dominican Sisters of Vence, and considered it his masterpiece. The serenely white exterior and interior is enhanced by the beautiful stained-glass windows (again using cut-outs) in blue, green and yellow, replicating the tree of life, expressing, in a limited space, the idea of immensity and serenity. The windows’ reflection throughout the white interior of the chapel emphasises the music of colour – so important for Matisse during his entire life. By Ursula Rehn Wolfman. Republished with permission from Interlude, Hong Kong.